I love all things ocean and beachy and that includes sea urchins. I love to incorporate those images in my designs, but natural items like sea urchins, sea shells, and starfish are fragile and do not often hold up well in jewelry designs. 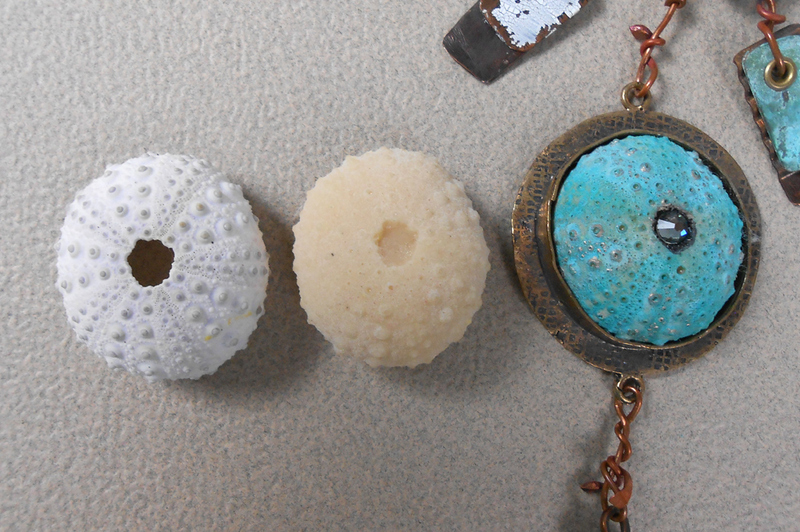 Having been introduced to Ice Resin and molding putty by Jen Cushman and Susan Lenart Kazmer, I found an ideal way to bring my favorite beachy things into my designs, while making them durable. I began with a nice sea urchin found in a bag of shells at a local thrift store. Using the putty, I formed it around the shell and let it set up. Removing the urchin from the molding putty is tricky, and I did have to put a few slits along the top. After the mold cured completely, I cast an urchin using Ice Resin tinted with some off-white acrylic paint. 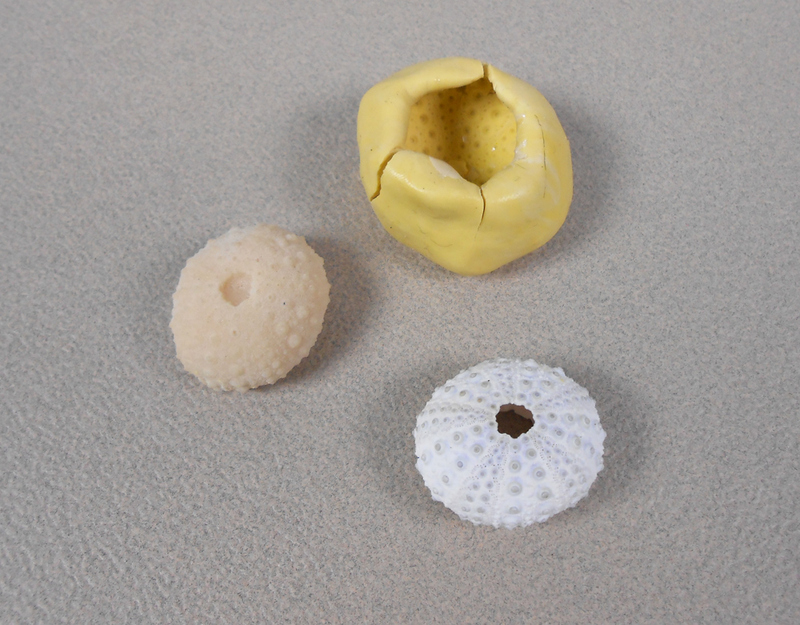 The resin urchin was then colored with paints and gilders paste. 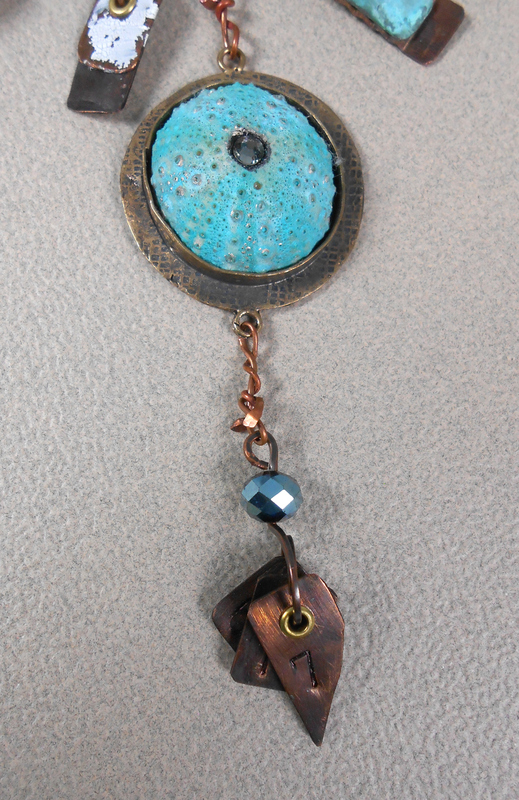 I added a Swarovski crystal in the center and mounted the urchin in a bronze colored bezel. 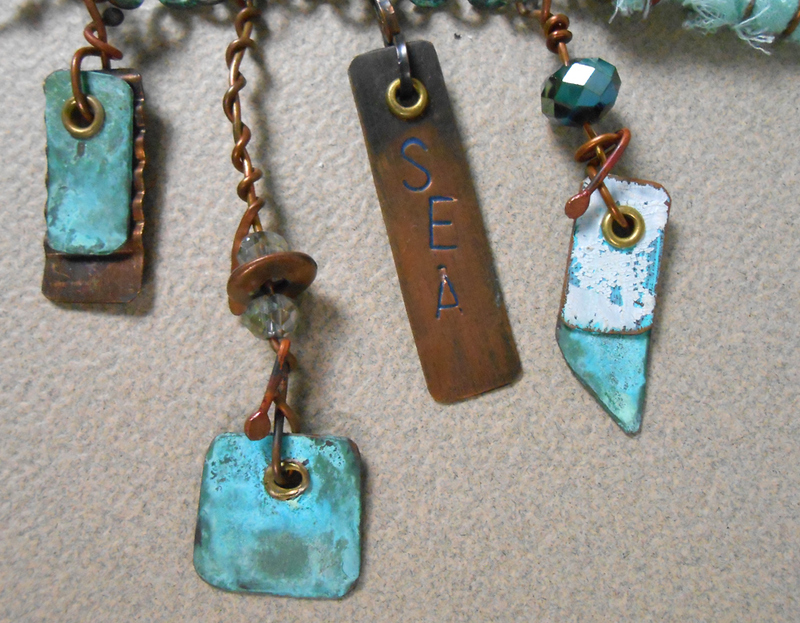 I’ve taken several metal working classes at the Bead & Button Show from SLK and last year was one on making components with texture and patina. 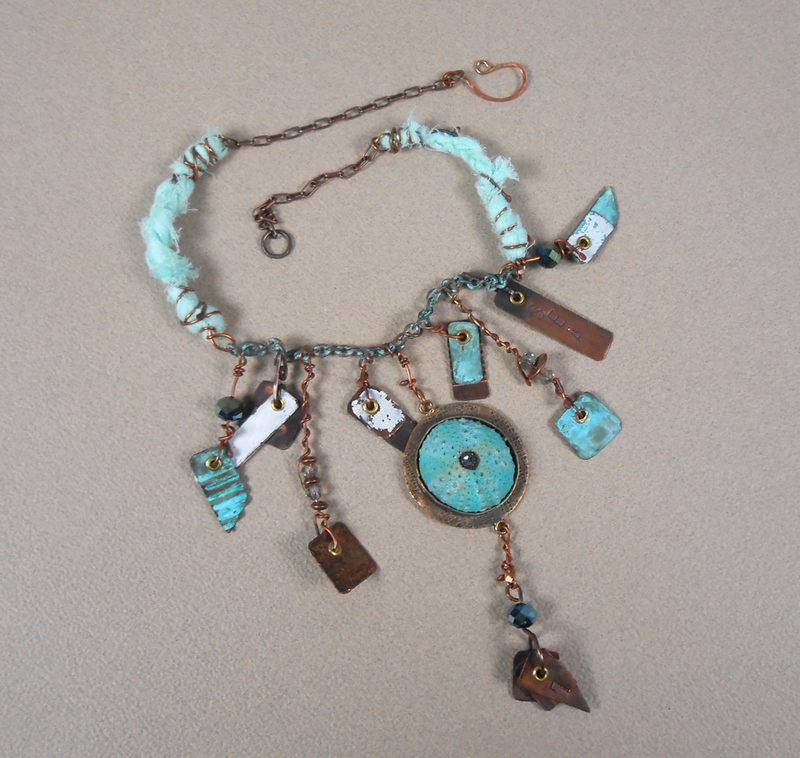 I combined these components with my sea urchin bezel, crystal beads, wire work, chain, and silk ribbon. 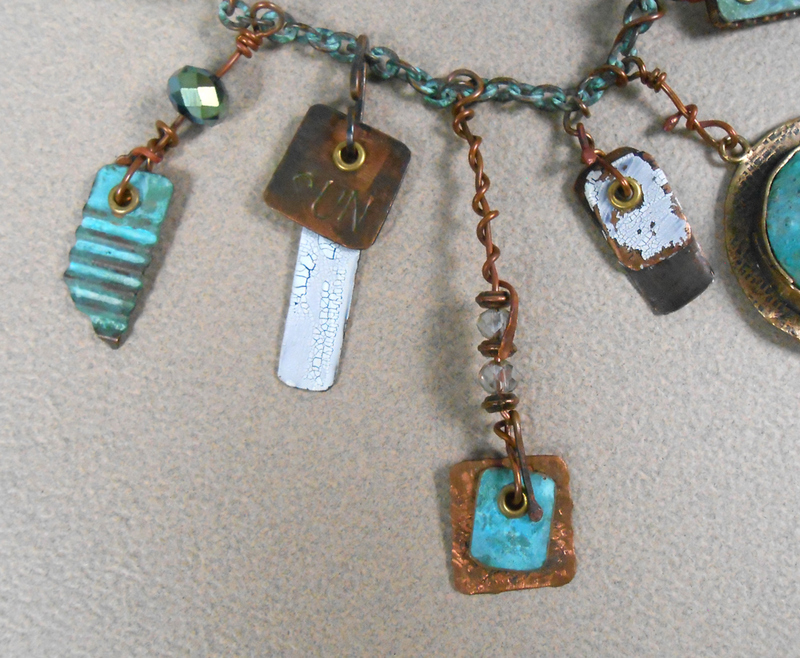 The result was a striking yet fun necklace that I love to wear. We used a special tool to corrugate the metal and metal alphabet stamps – “SUN” is on this second component. More corrugated metal (layered) and “SEA”. The eyelets were another technique she taught. The pieces that hang from the bezel have my birthdate on them. I’m a July baby. Maybe that’s why I love beachy things. I’m excited to be going back to Milwaukee to take another class with Susan in a few weeks.